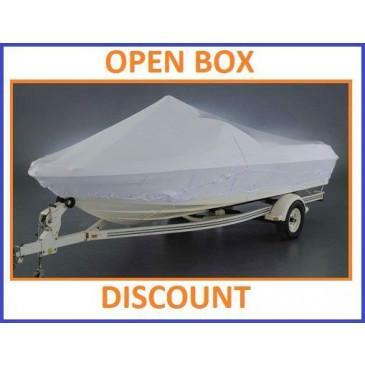 https://mrshrinkwrap.com/29-31-v-hull-boat-cover-by-transhield-open-box.html?___store=default 5263 29'-31' V-Hull Boat Cover by Transhield - OPEN BOX https://mrshrinkwrap.com/media/catalog/product/v/-/v-hull_obox_2.jpg 194.3700 242.9700 USD InStock /Closeout Specials /Closeout Specials/Open Box Transhield Covers This 29'-31' V-Hull Boat Cover by Transhield - OPEN BOX is easy to install! Transhield boat covers are a great choice for protection from the elements during long-term storage or transportation of your boat. Transhield covers are also easy to install! Transhield covers may be heated to shrink for a tight fit, which is necessary for demanding applications like long-term outdoor storage or transportation on the road. Shrinking of a Transhield cover is not required for light duty applications like indoor, covered storage. Transhield covers are most easily reusable IF not shrunk. Once your Transhield cover is shrunk around the top half of your boat, it will be more difficult to remove, but it is still possible to remove and reuse your shrunken cover if the user is diligent. Providing structure for and shrinking your Transhield Cover greatly increases its effectiveness in shedding water and resisting wind damage. Pole Accessory Kits by Transhield will help to support the under-side of your boat cover. Create the proper slope to shed water and outdoor debris by supporting your cover with a Pole Accessory Kit! Click here to view Transhield Pole Accessory Kits. To obtain the intended protection of a Transhield Boat Cover, you'll need to apply intense heat to shrink the outside of the cover once it is secured. The purchase of a heat gun might be a large investment if you are covering your own boat for the first time. Mr. Shrinkwrap understands that you may only require the use of a heat gun for an hour or so to completely shrink your cover. With you in mind, we will apply a discount to the rental of a Shrinkfast 998 Heat Gun when you purchase a Transhield Boat Cover in the same order. To receive a 25% discount on a Heat Gun Rental with your purchase of a Transhield Cover, simply check out with both the Transhield Cover and the Shrinkfast 998 Heat Gun Rental in the same cart. Indoor Storage Shrinking is not necessary for use as a dust cover when kept indoors. Structure is recommended, but not completely necessary. Short Term Outdoor Storage Shrinking is not essential for short-term outdoor storage if the cover is properly secured and taut. Secured structure is important to mitigate pooling water and debris. Possible pooling of water/debris and strong winds are concerns. Inspect your cover carefully, periodically. Long Term Outdoor Storage Shrinking is strongly recommended. Although Transhield covers are much thicker than shrinkwrap alone, Transhield covers will also stretch over time from the weight of pooling water and wind. Be sure to have secured structure below your taut Transhield cover! Inspect periodically. 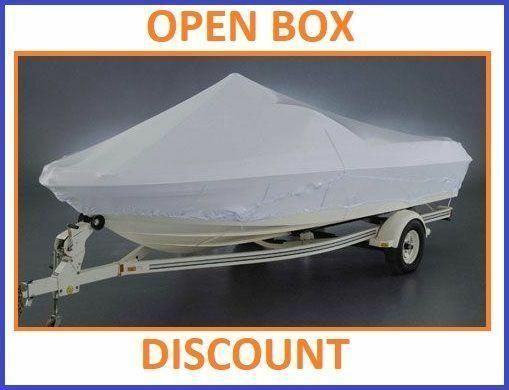 This 29'-31' V-Hull Boat Cover by Transhield - OPEN BOX is easy to install! Choose color option (if any) to enable shipping estimates.